Let’s just say straight off that this is not the classic version of Vichysoisse, the chilled potato-leek soup with its origins in the French cooking tradition. Instead, our version is a bit more of a backwoods country cousin, with its roots firmly planted in American soil. The origin of the soup known as Vichysoisse has been frequently debated. As the accepted story goes, it was created by French chef Louis Diat, at the Ritz-Carlton in New York in the summer of 1917. The story goes on to relate how, years later, he recounted that he was inspired by boyhood memories of a potato-leek soup made by his mother. True story or not, Vichysoisse is undeniably delicious and has achieved the status of a true American culinary classic. Our recipe differs from the original in several ways. 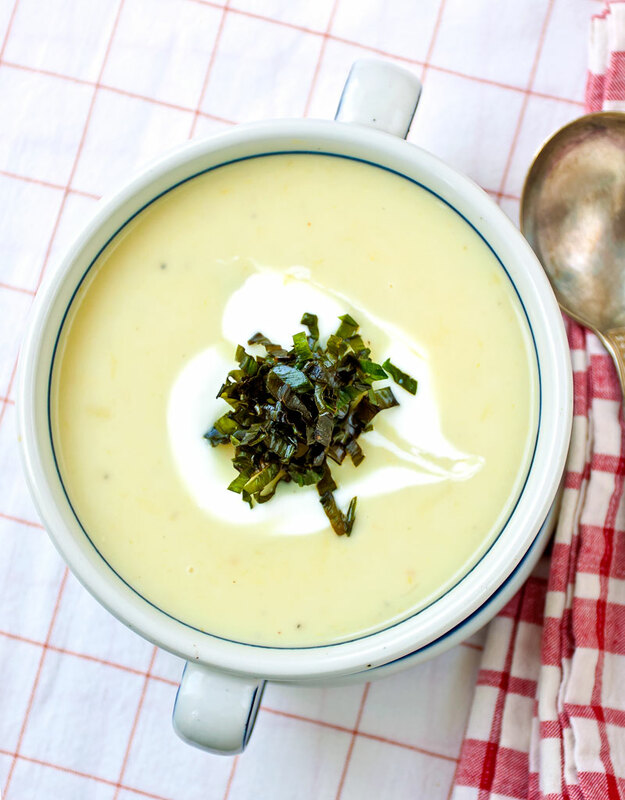 Most significantly, it uses ramps(Allium tricoccum), also known as wild leeks, instead of the usual thick-stemmed cultivated leeks, which imparts an entirely different character to the soup. We’ve also skipped the heavy cream, using only milk and chicken stock, which makes this refreshing soup lighter and far lower in calories. Lastly, our version is topped with crisp-fried ramp greens, adding a burst of interesting texture and intense ramp flavor. Those who are unfamiliar with ramps will note the stronger flavor of this wild member of the onion family. 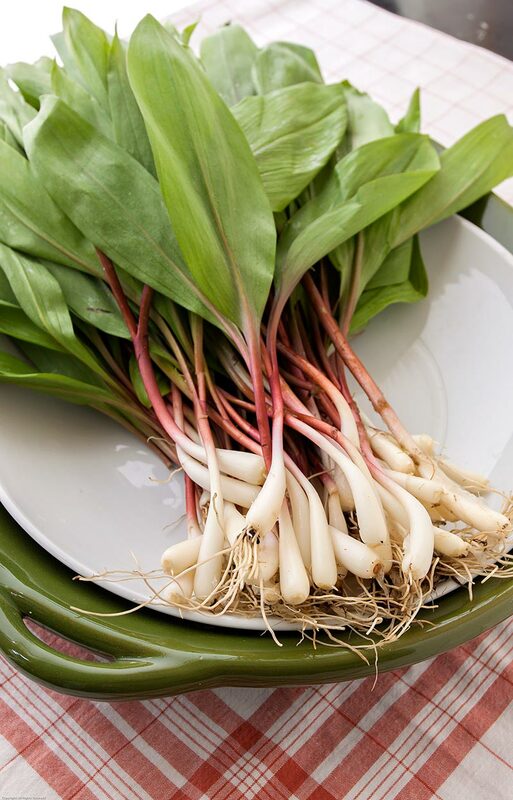 Ramps, which grow in eastern North America from the southern Appalachian hills up into the lower reaches of Canada, have a pungent, garlicky bite that sets them apart from their cultivated cousins. If you live in ramp country, you can harvest your own. If not, you can buy them in season at many upscale produce markets or order them online from Earthy Delights. One final note: if you do harvest ramps or wild leeks, make sure that you follow responsible foraging guidelines: never pick on private land without permission or on public lands where the harvest of wild plants is restricted. Most importantly of all, don’t overharvest. Pick only what you need, leaving the rest behind to grow for years to come. Trim the roots from the ramps and pull off the pulpy capsule, if present. Rinse well under cold running water. Cut off the green leaves from 8 ramps and set aside. Chop the remaining ramps, bulbs, stems & leaves. Melt the butter over medium heat in a heavy-bottomed saute pan. As soon as it melts, add the chopped ramps. Saute for 2-3 minutes or until the ramps begin to soften. Add the potatoes and saute for another 5 minutes, then add the chicken stock. Bring to a simmer, then reduce the heat to low and cover tightly with a lid. Simmer for 30 minutes or until the potatoes are very soft. Remove the soup from the heat and allow to cool slightly. Using a immersible hand blender, regular blender or food processor, blend the soup until smooth. Stir in the salt & milk and return to the heat. Do not bring to boil, just heat the soup through. Taste & adjust the salt to taste. Remove from the heat and allow to cool completely. Pat the reserved ramp leaves completely dry and cut crosswise into 1/8th inch strips. Heat the vegetable oil in a sauce pan over high heat. When very not, but not smoking, add the sliced ramp leaves a few at a time. Watch carefully to make sure that they cook crisply, but do not burn. Using a wire strainer, remove the crisp ramp leaves from the oil to drain on paper towels. Repeat until all the leaves have been crisped. Serve the soup cold in chilled bowls with a spoonful of the crème fraîche or Greek yogurt, if desired. Garnish with the crisp ramp leaves.